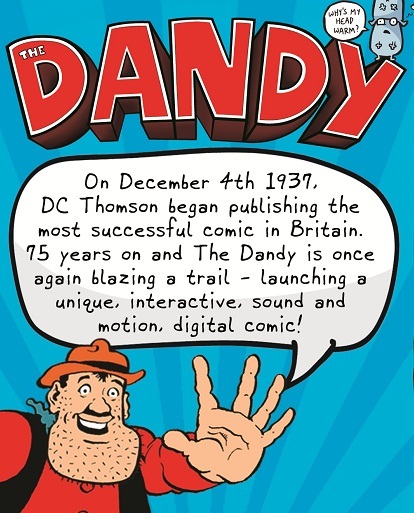 Regional publisher DC Thomson will launch an online-only version of its popular children’s comic The Dandy tomorrow. HTFP reported earlier this year that the comic will be printed for the final time tomorrow with a special edition to mark its 75th anniversary. Its digital edition will be unveiled today at an event at the publisher’s Dundee headquarters by the project team including editor Craig Ferguson, before it goes live tomorrow. The company claims the comic will be “Europe’s first technologically advanced comic for children” and it will be a “unique, interactive, sound and motion, digital comic”. Dandy characters include Desperate Dan, Korky the Cat and Bananaman and they are set to live on in the digital edition of the comic.